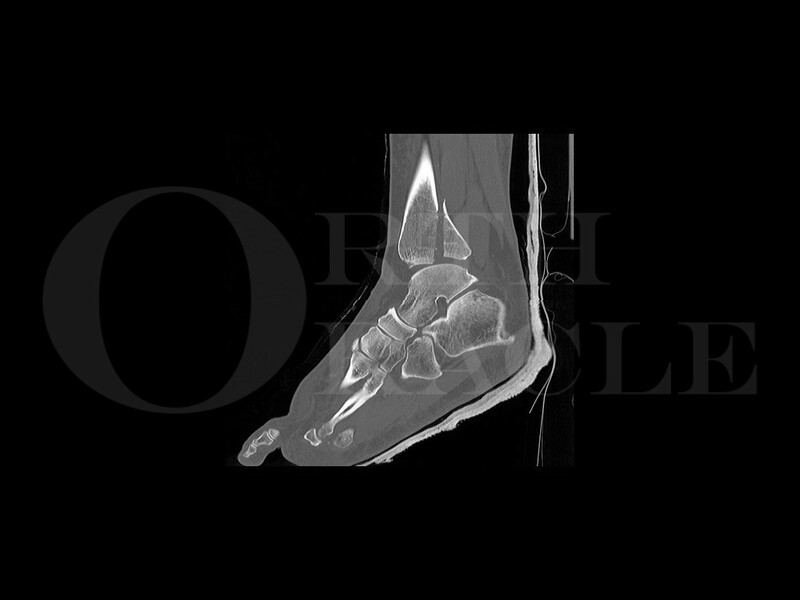 Learn the Postero-lateral plating of pronation-external rotation ankle fracture (posterior malleolar fixation) surgical technique with step by step instructions on OrthOracle. Our e-learning platform contains high resolution images and a certified CME of the Postero-lateral plating of pronation-external rotation ankle fracture (posterior malleolar fixation) surgical procedure. Most ankle fractures are stable meaning that, under physiological loading, the bony and ligamentous stabilisers of the ankle joint are sufficiently intact allowing normal positioning and motion of the talus in the mortise. Stable ankle fractures do not require surgical treatment. Some unstable fractures can be reduced and held in a suitable cast such that the reduction is maintained whilst fracture union takes place. However, achieving and maintaining reduction in some ankle fractures is not possible and it is these unstable fractures that require internal fixation. Medial injuries such as deltoid ligament or medial malleolar fractures often impact upon fracture stability. Posteriorly, fractures of the posterior tibial plafond or posterior malleolus are often associated with unstable fracture patterns. Laterally, a proximal fibula fracture or evidence of disruption of the distal tibio-fibular syndesmosis are often features seen in unstable ankle fractures. Orthopaedic trauma dogma has previously taught that the indication to fix a posterior malleolar ankle fracture is determined by the size of the fragment (oft quoted as 25-33% of the AP dimension). The real indication for fixation of these fracture fragments is to restore stability to an unstable fracture pattern. Quite often it is clear that the presence of a large fragment is an indication but the other reason for restoring stability by fixing these fragments is to reverse the pattern of injury especially in a dislocation. In my hands, the posterolateral approach is the workhorse to fix these fractures but significant propagation of the fracture lines into the medial malleolus may necessitate a separate posteromedial approach. Both of these approaches allow anatomic reduction of the joint surface and the application of appropriate fixation. It is for this reason that I never use screws placed from anterior to posterior. In this case, a 48-year old female sustained a closed injury to her right ankle after slipping. She sustained a closed, pronation external rotation ankle fracture pattern and her soft tissues were in good health when taken to the operating theatre within 24 hours of injury.